Indian cuisine meets Italian cuisine in this super quick and easy naan pizza recipe. It is ready in only 16 minutes thanks to the quick cooking of the air fryer! 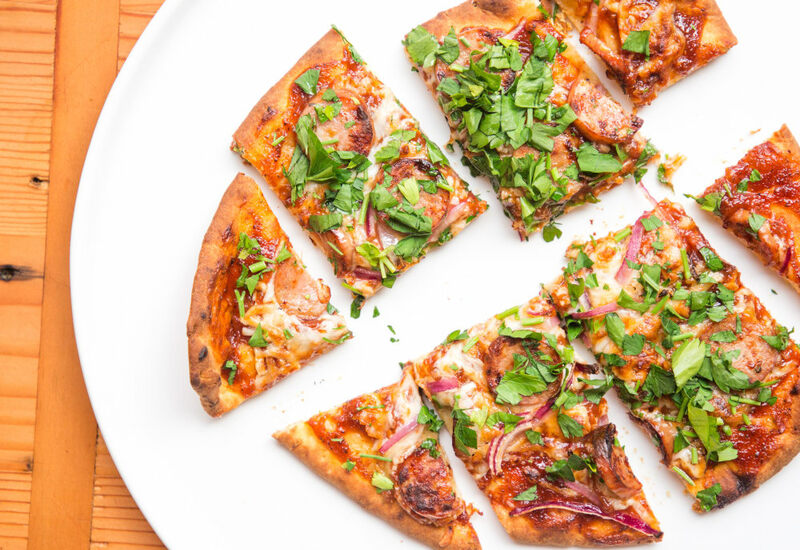 Layer barbeque sauce, mozzarella cheese, Gouda cheese, red onion, and chicken sausage on a naan bread for an individual pizza or as a sharing appetizer! Spraying the bottom of the naan before putting it in the air fryer basket will help it get extra crispy on the bottom. It's easier to build the pizza in the air fryer basket versus building it and then trying to put it into the basket. Add as much onion as you like. The red onion cooks really quickly and doesn't taste raw onion-y at all once cooked. Per Serving: 643 calories; 23g fat; 76.3g carbohydrates; 31g protein; 87mg cholesterol; 1792mg sodium. Love this mini personal size pizza! The chicken apple sausage paired perfectly with the barbecue sauce. This is great for an appetizer or dinner for one. It reminds me a lot of the barbecue chicken pizza at PJs but healthier. I only garnished with cilantro and it was perfect. I took this idea to make air fryer pepperoni pizza. Such an awesome idea and super quick. THANK YOU for the tip about spraying the bottom of the bread. The crust was perfect.